A research group of Tokyo University of Agriculture and Technology, Tokyo Institute of Technology, Keio University and Tohoku University have successfully developed an artificial cytoskeletal structure for cell models (liposomes or artificial cells) using DNA nanotechnology, and demonstrated that liposomes with the cytoskeletal structure were almost as strong as living cells. Liposomes have been used as a material in many common products such as capsules for drug delivery and cosmetics. However, the membrane is fragile, leading to problems such as collapse of liposomes by slight stimulus, causing the entrapped compounds to easily leak. To improve the function of liposome as a capsule, it has been needed to develop a method that can toughen liposomes and control their strength. In order to increase the strength of liposomes, Miho Yanagisawa at Tokyo University of Agriculture and Technology, Masahiro Takinoue at Tokyo Institute of Technology, and their colleagues developed a network structure of DNA that supported membranes similar to a cytoskeleton in living cells using DNA nanotechnology (Figure 1A). The DNA strands used in this study bind to each other and create a network structure by decreasing temperature (Figure 1B). Also, since DNA has negative electric charge, using the attractive force between DNA and the inner layer of liposome with positive charge, they succeeded in forming a DNA cytoskeleton that directly supported the liposome membrane as backing. Liposomes are generally easy to collapse even when a slight osmotic pressure was applied to liposomes. 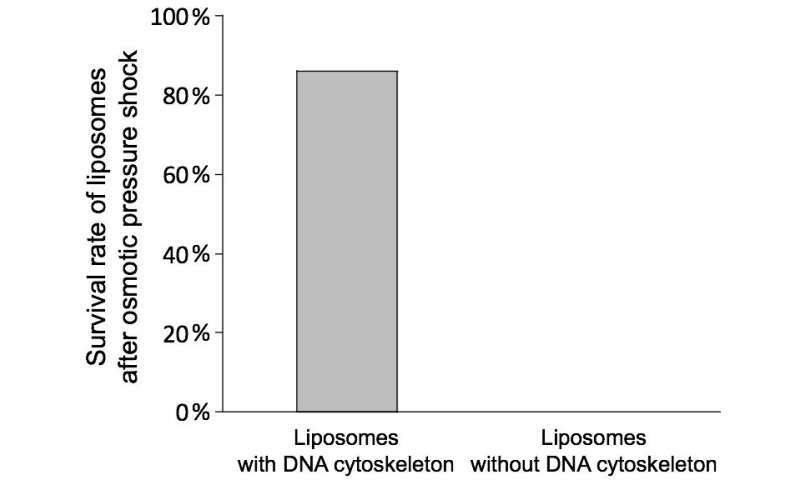 In contrast, liposomes with the DNA cytoskeleton they developed were tolerant of an osmotic pressure even when the applied osmotic pressure was comparable to that assumed to be applied in our body (Figure 2). This reinforcement function is derived from the network structure of DNA; also, there is an advantage that the strength of the DNA cytoskeleton can be control by the DNA base sequence design. In addition, since the artificial cytoskeleton is formed using DNA, it is expected to impart various functions such as induction of membrane collapse based on DNA chemical reactions for controlled release of entrapped compounds. This research results are published on the online version of Proceedings of the National Academy of Sciences on June 26, 2017.